One of the most important and common problems in ecological studies is in determining how large a population is in an area. Researchers can't be everywhere and most of what we are interested in usually occurs 'offstage', unobserved. For example, after a mammalian pest control operation of possums or rats we might be interested in which species remain and how many individuals are left. There are several mechanisms for trying to answer these questions. One of the more unusual is the waxtag. 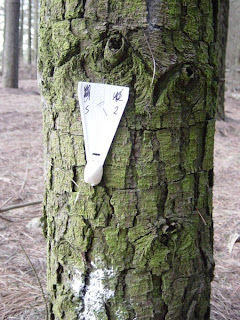 Wax tags are white plastic sheets that can be attached to trees with have a large blob of wax at one end. It turns out that many mammals, especially possums, like to bite these blobs which leaves a record of their presence through the bite marks. Placing out the tags has several advantages over other methods, like leg-hold traps, in that they are light and inexpensive and so vast numbers can be placed in difficult areas. The amount of tags bitten, or interfered with then provides an index of presence of mammals and their activity levels. One problem with the tags is that it is not always obvious which species has bitten the tag. Another is that we don't know when one possum bites lots of tags in a night or if several possums bite the same tag. A study by researchers at Lincoln University which has formed the main PhD topic for Mariana Vargas has addressed this issue and has been published in Molecular Ecology Resources. Vargas and her colleagues assumed that a possum, or anything else for that matter, biting the wax would leave behind DNA. After much exhaustive testing a method was devised that reliably recovered DNA from field collected samples and that could confirm the species identity of the biter. Vargas then went further and was able to develop a method that could successfully identify microsatellites and, therefore, individuals. Now that this methodology is in place it opens up many options for monitoring possum populations. How many individuals are left? Are some more active and roam further than others? Are some individuals more curious than others? What influence do environmental effects like rain, moon phase or drought have on individual behaviour? He pulled his coat up around his neck. Another crime solved. He had to hand it to the eggheads - their gizmos had worked. Grabbing a handful of waxtags he ambled off down the track. There are a million stories in the temperate jungle and this was just one of them. Not so fast, sparky. Who hired the possum? Your average lowlife pesky possum is too dim-witted to come up with a crime this diabolical. Notice how it bit on a wax tag thinking it was food. Not smart. When you use your swanky DNA trickery to track down your possum, be sure to ask it some questions. The kind of questions it can't refuse. The forest won't be safe until the whole mammalian criminal underground is exposed.